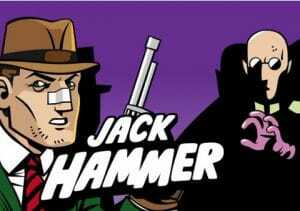 Based on the adventures of a 1940s gumshoe, Jack Hammer vs. Evil Dr Wüten is a 5 reel, 25 payline video slot from Net Entertainment. Featuring superb comic book visuals, this private detective yarn comes with sticky symbol re-spins which can create some monster combinations. There’s also a bonus feature that awards up to 60 free spins with all payouts trebled. Play from between 25p and £500 per spin. A tip of the hat (in this case a fedora) to the NetEnt design team which has created a stunning looking game – the symbols on the reels are all drawn like a classic comic strip and feature a selection of flasks full of poison, a phone, a newspaper, a mobster in a car and an airship. The higher value quartet of symbols include a paperboy, woman, Evil Dr Wüten and Jack Hammer. The private eye is the most lucrative payer, offering 1,000 coins if you land a 5 symbol combination. There’s also a wild that replaces all other symbols apart from the free spins scatter. The first feature to note is the Sticky Win feature – whenever you land a winning combination of 3 or more symbols, they will be frozen in place and a re-spin awarded. These keep on coming as long as a new winning combination is created. Get on a roll here and the coins can quickly build. Jack Hammer also comes with a traditional Free Spins feature which is triggered by landing the bomb scatter – 5 bombs will get you 10 free spins with 15 on offer if you find 6. That tally increases to 20 with 7 scatters with 25 spins awarded 8 of them. Land between 9 and 15 scatters and you’ll win the maximum 30 free spins. All wins made during the feature are boosted by a 3x multiplier with the payouts trebled. Those initial triggering numbers may sound a little high but remember that the Sticky Wild re-spin feature can deliver some weighty combinations. You can get also get scatters during the feature to retrigger the feature with up to 60 free spins possible. We found Jack Hammer vs. Dr Wüten to be a very enjoyable game – it looks terrific and comes with a sleazy soundtrack that’s right in keeping with the private eye theme. The features stack up well too, especially the Sticky Win feature which keeps things flowing at a decent lick in the base game. Throw in the free spins feature where all wins are trebled and Jack Hammer becomes a very playable video slot. Variance wise, it’s in the middle with wins of up to 1,500 times your stake on each spin available. If you like the Sticky Win feature, WMS offers something similar (Spinning Streak feature) with Kingdom of the Titans offering it.